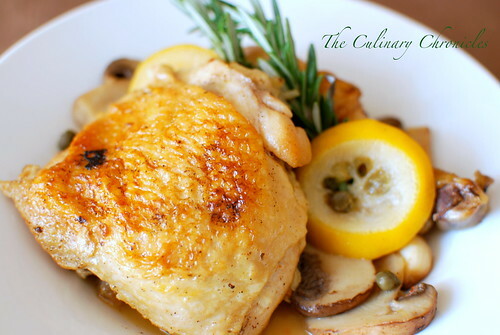 I often braise chicken because it’s so easy and makes the meat deliciously juicy. And best of all—you only need to use one pot! Liberally season the chicken with salt and pepper. In a large Dutch Oven heat olive oil to medium high. In batches, brown chicken pieces on both sides and transfer to a plate. Discard all but 2-3 tablespoons of left over grease. Lower heat to medium and add garlic cloves, cooking until lightly golden. Add onions and cook until all items are evenly browned. Add chili flakes and sauté for an additional minute. Add mushrooms and sauté for an additional 2-3 minutes. Carefully add chicken stock and bring to a boil. With a wooden spoon, scrape the brown bits from the bottom of the pot. Return the chicken to the pot with the skin side up. Add lemon slices, bay leaf, capers, and rosemary sprigs–submerging those items underneath the liquid. Place lid over the pot and put into the oven for 25-30 minutes or until chicken is done. Carefully take the pot out of the oven. Remove rosemary sprigs, bay leaves and skim off and discard any fat and impurities from the juices. Check for seasonings and adjust with kosher salt and pepper as necessary. 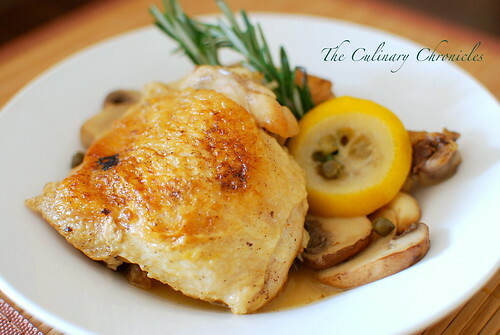 Plate chicken with sauce and serve with fresh bread or other desired sides. Previous Post Chocolate Stout Cupcakes with Irish Cream Buttercream…..Slainte!! Next Post Delicious Vietnam #11 Roundup! This is a beautiful dish! I have about 40 lemons that I brought in from my neighbors tree so this will be on my weekend list. Love the one pot thing! Hi Tammy! 40 lemons—Delicious! Sounds like lemon bars could be in your future, too! 🙂 Cheers! So, this may be a dumb question but can a stainless steel stockpot serve as a Dutch Oven? Hi Kelly! Not a dumb question at all! It really depends on the stainless steel pot. Definitely do not use it if it doesn’t have metal handles or lid handles. Also, make sure that pot has an all stainless steel lid to cover it. Lastly, the pot should be rather thick–if using metal. Hola Nam; ¡WOW! que pollo mas rico estofado al horno. Lo probaré y te diré que tal me ha salido. Mi ingles es bastante malo pero he navegado por tu blog de la mano de google y es fantástico y tú me pareces una chica fantástica, llena de vida y muy generosa por compartir todas estas maravillosas recetas con nosotras. Vivo en Guadalajara, España a 56Kms. al noreste de Madrid y cuenta conmigo como seguidora, ya me he suscrito. Sigue así de maravillosa, Un beso y Abrazo. Yay! I finally have something to cook in my dutch oven, which is so pretty, but hardly used. I love this dish, it looks like something I could whip up for a weeknight dinner. Thanks! Hello!!! Thanks for stopping by! This really is great for a weeknight meal. Quite easy without giving up any great flavors 🙂 Cheers! Oh man. I bet your home smelled AWESOME! It SURE did—lol! Thanks so much for stopping by! I think this might be the recipe that gets me off of my brining and roasting kick. Sounds absolutely delicious…..and lemon and mushroom are my favorites too! I LOVE this recipe! 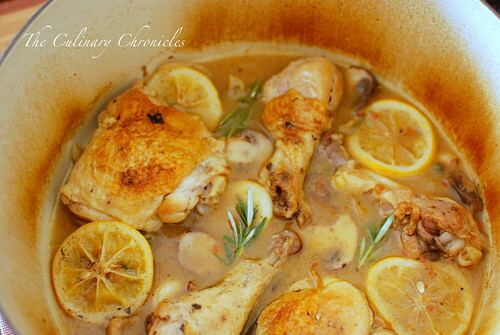 I am always looking for recipes to use in the dutch oven, this is perfect! Hello Tiffany! Don’t you just love dutch ovens?! 🙂 Thanks for stopping by! This recipe sounds really good! my wife needs to eat the leaner breast meat… would this work with bone in breast as well? I worry it might get overcooked, but i suppose it could go in a little later than the legs and thighs… would love to hear your thoughts on this. with all those lemons, does the dish come out too sour/lemony? i’ve made something like this, but it was cream-based. i am a fan of slow-cooked meals like this and your pictures turned out fab. Hi! I stumbled across your website through foodgawker and I really love it! Nice recipe! Looks very delicious! I’m going to try it asap! I was wondering if I could add some orange juice and honey too. What do you think? Hi Cindy! Thanks for checking out the site! I think OJ would be a great addition but may consider leaving out some of the lemons to reduce the acidity. Cheers! This was AMAZING!! I don’t have a dutch oven so I made it in a pot on the stove and then transferred it to a roasting pan with tin foil on top and it came out perfectly 🙂 Thanks!! So glad it worked out well for you Erica! Looks delicious…I will definitely be trying this one. Thanks for posting. I think I’ll try this in a tagine, which is basically related to a Dutch oven, except it’s made of pottery. But, it still uses low and slow cooking methods. Besides, I have some home-preserved lemons for my North African recipes that I must use up. I’ll probably go light on added liquids, because the tagine retains liquids, and reduce the heat from 350 in the oven to a slow simmer on the stove top. I don’t know why I continue to try new things for my poor wife to have to sample. I must say there have been very few disasters and most things turn out pretty well. I’ll let you know how this experiment goes. A tagine with preserved lemons would be lovely! In fact I have a jar of homemade preserved lemons that a friend gave to me—sounds like I’ll be making this dish again soon with them! As for trying new things, heck—it’s the only way to discover new delish foodventures, right? 🙂 Cheers! Hi–I made this last night and thought that while the mix of flavors here was good, it did not seep into the chicken and instead the dish came across as having the flavor on top of the chicken? It needed more time to marinate. Maybe slow cooking this would work better to this end. Hi Martha, thanks for the feedback! Hi there! I know this is an older post, but I have a question. Do you have to use bone-in chicken? Or do you think I could I do this with a boneless chicken breast? Thanks so much for the recipe! I actually just finished making it. I’m not sure if I made it wrong or the lemon I used was strong, but it was very bitter any tips? Thanks for this recipe, it was really a winner. I didn’t change a thing but did cook the sauce down to a thicker state, really tasty.